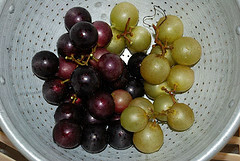 Scuppernong grape, named the state fruit of North Carolina in 2001, is a bronze-green variety of the muscadine grape (Vitis rotundifolia). It is one of the best-known names in North Carolina's (and the nation's) viticulture, being the first grape actively cultivated in the United States. Once also called the white grape, the big white grape, and the Roanoke grape, the scuppernong gained popularity and noteworthiness as a wine grape on the south side of Albemarle Sound. In 1811 it was named after Scuppernong River, Scuppernong Lake (now Lake Phelps), and the settlement of Scuppernong, all around Washington and Tyrrell Counties. The word "scuppernong" comes from the Algonquian askuponong, meaning "place of the askupo," which is the sweet bay tree (Magnolia virginiana). Old, variant spellings of the word include scoponum, coscoponum, cuetupcaning, skoupernong, and cascepunong. Samuel Huntington Perkins, a Yale graduate on his way to Lake Landing Plantation on the southeastern shore of Lake Mattamuskeet, arrived at Roanoke Island in October 1817 and remarked in his diary, "The fig & grape here arrive to perfection. The inhabitants supply themselves with good wine, but manufacture little or none for exportation." In June 1823 Thomas Jefferson ordered a 30-gallon barrel of "the pure juice of the grape" through a Plymouth factor named Cox. In 1840 North Carolina was the premier winemaking state in America, its largest vineyard a six-acre farm at Brinkleyville in Halifax County. Sixty years later another Halifax vintner, Paul Garrett, won a prize in Paris for scuppernong wine; in 1904 a sparkling scuppernong called Paul Garrett's Special Champagne took top honors at St. Louis's Louisiana Purchase Exposition. Within a few years, Garrett's sweet Virginia Dare wine was among the most popular vinous drinks of the United States. When Frank Hollowell of Bayside Plantation, Pasquotank County, put in scuppernongs there in 1973, he cited as his inspiration other up-and-coming growers of that day such as the Wood family in Chowan County and the Sell family in Brunswick County (who perfected an absolutely dry scuppernong wine). Today in Duplin County, the Fussell family operates Duplin Wine Cellars, vintners of a white scuppernong wine, a scuppernong blush, and a sparkling scuppernong with a recipe "developed from an article written by Sidney Weller in 1853" and boasted "to be the oldest and best champagne produced in America." These contemporary growers and vintners have all followed an old tradition, as North Carolina for the better part of two centuries has been an American leader in utilizing its native grapes. Clarence Gohdes, Scuppernong: North Carolina's Grape and Its Wines (1982). Robert C. McLean, "A Yankee Tutor in the Old South," NCHR 42 (January 1970). Albert E. Radford, Harry E. Ahles, and C. Ritchie Bell, Manual of the Vascular Flora of the Carolinas (1968). Bland Simpson, "Nature's Vineyards," Wildlife in North Carolina 56 (September 1992). 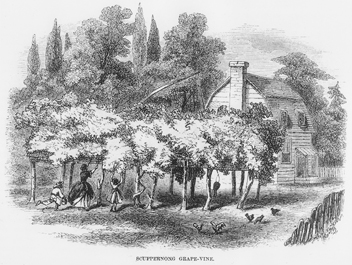 Scuppernong grape arbor beside a dwelling in northeastern North Carolina as depicted in an 1859 engraving in Harper's New Monthly Magazine. North Carolina Collection, University of North Carolina at Chapel Hill Library. Scuppernong Grapes, NC State Fruit. Image courtesy of Flickr user dalexfilms. Available from http://www.flickr.com/photos/dalexfilms/3976349812/ (accessed August 21, 2012).